Storage in Front Room #1 - Ramblings of Mad Shutterbug & the Border Collie Bros. Some of the storage shelving we just put into Studio 318. 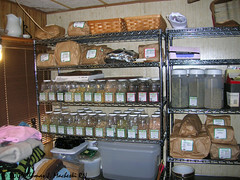 Most of what you're looking at is Herself's stock of herbs and spices she sells through her Carmenetta's Cottage store. Does she sell them online? We are slowly shopping for another site to host, one which supports purchasing on-line better than does ATT Worldnet.